Sharpen your sword, pick up your shield and prepare to do battle as a knight! Discover everything you need to know about knights and castles with this brilliant book. 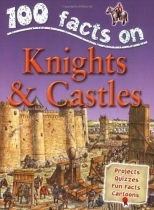 One hundred facts, fantastic illustrations and hilarious cartoons give you the inside story on castle life, while fun quizzes test your knowledge.